Similar to the way that overdone CGI can have an unrealistic near video game effect especially when magnified a la G.I. Joe, The Spirit, Quantum of Solace, Race to Witch Mountain and Watchmen, special effects from yesteryear can also call unwanted attention to themselves when transferred to Blu-ray high definition. To this end, you can almost think of it like the laughably flawless Botox of today that nobody takes for reality and the cake makeup that just couldn't hide the wrinkles of years past. However, the main thing to remember is that regardless of the tools used, it's the story and our investment in the goings-on that trumps any flaw whether it's overblown or outdated technological efforts. 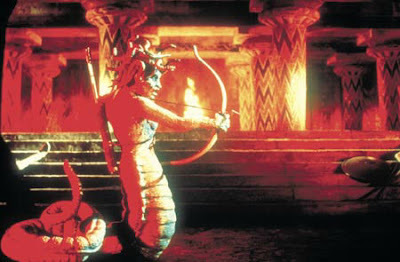 And luckily, unlike any of the films I named at the start of this review, director Desmond Davis' 1981 classic interpretation of the Perseus myth manages to keep us fascinated by its epic structure that works in tandem with the wondrous imagination of special effects maestro Ray Harryhausen. 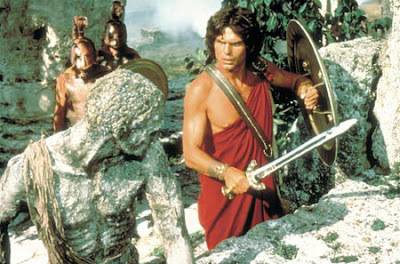 Taking what he learned starting out as an effects man working under the tutelage of King Kong's stop motion technique pioneer Willis O'Brien to develop the “Dynamation” system and genre in its own right for three decades, Harryhausen topped his work on films like Jason and the Argonauts, One Million Years, B.C. and The Village of Gwangi with the massive undertaking Clash of the Titans. However the painstaking stop-motion animation process that's still used today in Nick Park's Wallace and Gromit series hasn't aged well because as opposed to Park's 100% animated work, director Davis blended the animation with live-action. Thankfully, the story is still there and it remains as powerful and gripping of a hero's journey as ever. Having seduced the locked away daughter Danae (Vida Taylor) of the King of Argos (Donald Houston) by appearing to her in gold form, Zeus (Laurence Olivier) isn't about to let her perish at sea where she's been banished to die along with his unborn son. After beseeching Poseiden's assistance in unleashing the ancient sea monster Kraken to destroy Argos, killing the merciless king and its cruel people with an equally merciless act, Zeus ensures that Danae and the son she'll call Perseus will survive the ordeal. 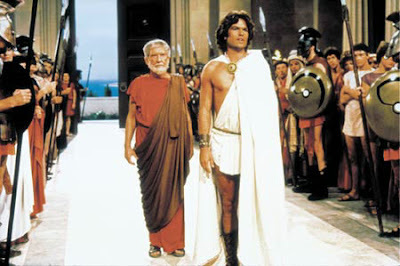 Destined to follow in his father's footsteps as the former heir to the throne, even without Zeus back on Argos, Perseus grows into a handsome and healthy young man (Harry Hamlin). 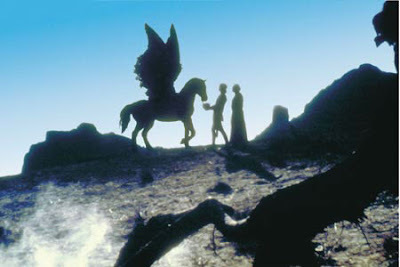 A few more double crosses later, Perseus winds up embarking on a perilous quest to save the beautiful Princess Andromeda (Judi Bowker) from becoming a virginal sacrifice after a jealous goddess sends Perseus directly into harm's way. 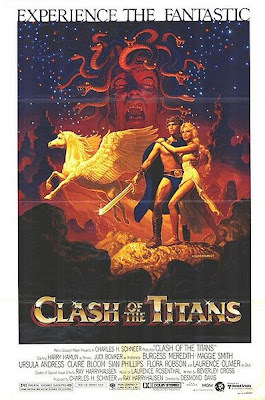 And during Titans' roughly two hour running time, it's filled with memorable characters such as the scene-stealing Burgess Meredith as the scholarly scribe Ammon and several villainous obstacles thrown into his path. Yet while even the snake headed Medusa, giant scorpions and two headed dog just don't pack the same intense wallop they did even a decade ago, it's still an exciting tween friendly adventure that's of particular interest to animation devotees. Despite a glorious Blu-ray booklet presentation filled with production notes, bios and full color photos along with movie cash to see the 2010 remake, overall you can still probably get by visually in the original DVD. 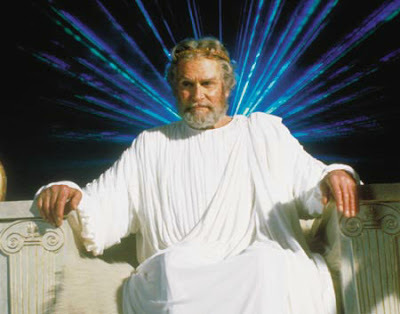 For, aside from the added information and extra featurettes, the only thing to recommend a jump to the Blu-ray price commitment is its rich digital surround sound presentation that pours out of all five speakers and subwoofer, trying like Zeus to make up for the loss of visual luster in the animation. 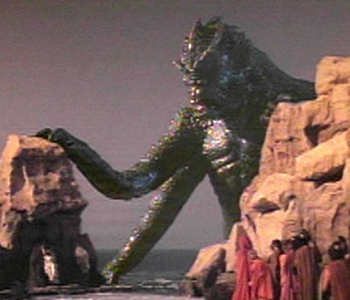 Still, better than overdone CGI (or Botox for that matter) any day of the week, the myth of Perseus has never been better told than through the creative freewheeling mindscape of kid-at-heart ingenious effects man, Ray Harryhausen.